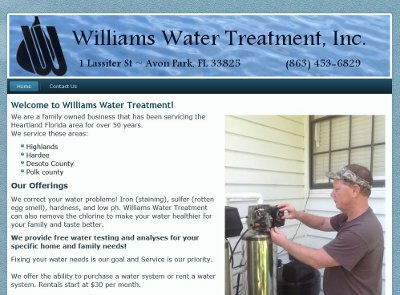 Bill from Williams Water Treatment in Avon Park, FL contacted us a few weeks back about getting his business online. He is a local water treatment specialist that provides services and equipment to ensure healthy water in both residential and commercial locations. Bill sent us the information and graphics that he wanted on the website – and we got to work right away. Within only 24 hours, his website was fully up and ready for his review. Bill requested that we make a few small changes to the site – but otherwise it was perfect! We appreciate the trust that Bill placed in us for making him an affordable website for his small business. His website is at williamswatertreatment.com. 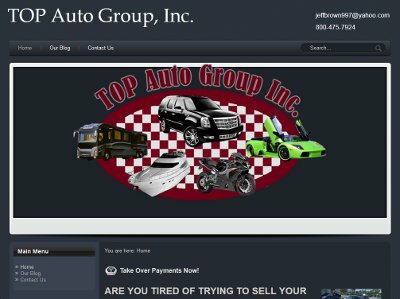 Cheap Website Design For TOP Auto Group, Inc.
Jeff from TOP Auto Group, Inc. located in Scottsdale, AZ contacted us to setup a cheap website design for him. As he promised last week, he was very happy with the logo design that our graphic designer created for him and he said a website would be pending. Just a few days after, on Saturday, he contacted us to get started on a low-cost website design for him. He made the initial pre-payments required and we got started on his website right away. The website was just finished up today. However, he requested that the site not be made live or published out to the public – but wanted to be able to use it to show possible investors at the current time. So we set him up with a private website link so he will control who can see the site by giving out the link. Jeff has indicated that this was just a quick, cheap website design that he wanted for now – but once his business takes off, we will be making a more detailed website for him with many other features and functions. We appreciate the additional business that Jeff has given us – and he was happy with the work we did that he said “Very nice looks you did a GREAT JOB!!!!!”. Nina Guest and her husband, Bill, have been long-time customers of BsnTech Networks. They came to us a few years ago needing help with two websites. 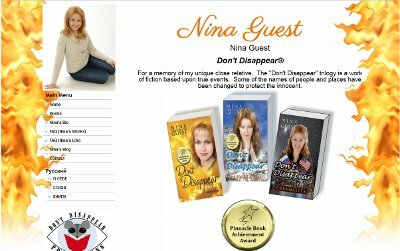 Nina Guest is an accomplished writer from Russia – and she runs a company for marketing her books – Don’t Disappear, LLC. – and then she also wanted a personal website that showed her books and some personal information about her. Nina was doing some comparisons of her site versus other writers and decided it was time to do a re-design of her site. Nina was great with providing BsnTech the information needed for the website changes – so we started on Friday and fully finished up with all of the site changes and the re-design by Sunday afternoon! Nina has constantly given BsnTech compliments throughout the website re-design. Upon full completion of the site, she mentioned in an e-mail – “You are wonderful, Brian, to work with. Thank you very much!”. We appreciate the continued support and business that both Nina and Bill have provided us over the years – and look forward to a continued relationship with them. Nina’s website is at ninaguest.com. BsnTech Networks was contacted by Eric from True North Candle Company. He was wanting to have a rustic logo created for his candle company. Eric provided us two links to other sites that he wanted to give us for ideas for his logo. Our graphic designer worked through about six different mock-up designs until Eric was fully satisifed with the logo that we created for him. At BsnTech, we try to make a few different design styles for logos so customers can see a few different ideas instead of only seeing one. That allows our customers to have a decision about the logo. Eric has indicated that he was very pleased with the fast turn-around and the logo that we designed. He is now having us create another logo for another business venture he has. In addition, he may be choosing BsnTech Networks to create an eCommerce site for his candle company. Thank you Eric and True North Candle Company for the ability to create a logo for you! BsnTech Networks Creates Logo For Top Auto Group, Inc.
BsnTech Networks was contacted by Jeff at Top Auto Group, Inc. inquiring about logo design. Jeff had a very specific look that he wanted for his logo. Our graphic designer pulled throgh and created a logo for Jeff very quickly – completing within just a few days! The logo went through a few different modifications to get to the look that Jeff wanted – but that is all included in the cost of our logo design. We simply require a small pre-payment (20%) to get started on the logo and then the final amount is due upon successful completion. If the customer isn’t satisfied with the work – even after several modifications, there is no obligation to purchase the final logo design. Jeff has already had us start working on a website for his business based on how satisfied he was with the logo design. BsnTech Networks was contacted by Shane, the owner of HWS Inspections, LLC a few weeks ago concerning some questions about search engine optimization (SEO) and how he could be found more easily online. We went into great detalis to explain how the process worked and the different kinds of SEO services that we offer. In the end, Shane decided to choose our entire SEO services package which included submission to online business databases, on-page SEO, and the advanced off-page SEO package that we offer. On his website, it was made by a family member and the site suits their needs. However, it was not optmized at all for the specific keywords he wanted to be found for. It needed a few hours of work to fully bring it in-line with SEO standards. Even only after approximately five days, his website already went from being no where in the top 100 for the keywords he wanted to target – to going to pages one and two! One of his phrases is already ranked #3 in Google and the other two are #16 and #20. With SEO work, you never can tell what will happen. There is no guarantee as to the kind of results that we can achieve for customers because it fully depends upon their budget, how well they continue with the SEO services, and the competitive nature of the keywords that they wish to target. 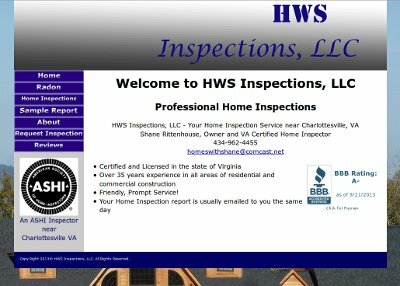 Shane’s website for HWS Inspections LLC is at hwsinspections.com. We appreciate the business from Shane and look forward to a long relationship with him as we help him manage his online marketing needs! Dennis – a co-owner of Light on the Lake in North East, PA contacted us a few days ago. A tragedy occurred with their previous webmaster and therefore they were looking for a new company to assist with their website requirements. Unfortunately the main domain name that Dennis had – lightonthelake.com – was under the previous webmaster’s account and it expires today (9/19/2013). Dennis purchased four other domain names for the site and is hoping that down the road, they will be able to purchase the domain name that they have lost. BsnTech Networks stepped in very quickly and made a full backup of their website. In the event that the domain name expired, they would have also lost their website since they had no information about the website hosting as well. A few changes were made on the website – mostly to update their e-mail address – and it was then restored and setup on website hosting servers owned by BsnTech Networks. Dennis has also expressed a potential interest in having us fully create a new website for their bed and breakfast business. Their new domain name is at lightonthelake.net. We look forward to a long-term relationship with Dennis and Light on the Lake for all of his website hosting and website maintenance requests! 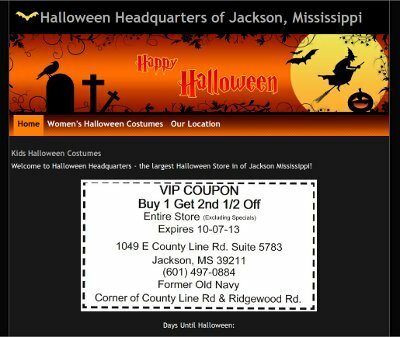 Bill from Halloween Headquarters of Jackson Mississippi contacted us a few weeks ago asking about several kinds of website services. He wanted to know the different kinds of online marketing that was available – so we informed him about the positives and negatives of both kinds of online marketing – either through search engine optimization (SEO) and pay-per-click (PPC) advertising. In Bill’s case, he needed to choose the PPC advertising. SEO marketing can take several months before results are achieved – fully depending up on the competitive nature of the keywords and phrases chose. Since Bill operates a halloween mega store in Jackson MS, he needed to understand that PPC was the only method that was going to bring results this quickly – since halloween is only six weeks away! After providing that education, he wanted to think the matter over for a bit. He then contacted us late last week and said “Let’s get going and get this site up!”. So within only a few days, we had his site fully up and running to his satisfaction. We appreciate the opportunity to create a halloween website design for Bill – and hopefully he will also have us manage his PPC advertising campaign. 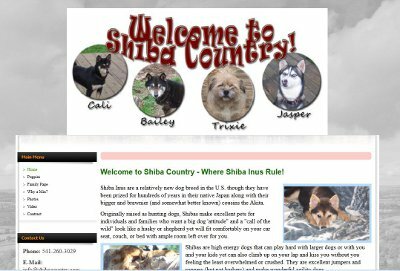 Cheri – the owner of Shiba Country – contacted us over a year ago inquiring about our rates and service offerings. With her busy schedule, she had some time to get started on her website re-design. Cheri originally had another website that was made from another designer. However, she wasn’t able to easily update the website and was lost when it came to doing those changes. Because she is a dog breeder, she needed the ability to update her website with the new litter of pups that she had available for sale. In addition, Cheri had branched out to making YouTube videos as well and couldn’t figure out how to put these videos on the site. BsnTech helped her through the entire process. We did a full website re-design for her although much of the same pictures and artwork was used at her request. We copied over each of the pages from her old website and put it into a Content Management System (CMS). By doing so, this allows her to go into her website – without the use of any software on her computer (other than a web browser) to update and make changes to her site. BsnTech then had a screen-sharing training session so we could show Cheri how to update her pages, embed videos into her site, and answer any other questions she had about managing her own website. Cheri was exceptionally pleased with the service that we offered that she will also have us re-design her second website as well! We look forward to starting on that project for her – and becoming her one-source solution for website services! Trey Douglas had us create a website for him a couple of months ago. His idea was to put all of his three service offerings directly on the site. However, he found out that this wasn’t working in the search engines very well. So, Trey contact us again to make another website for him! We also answered a lot of questions about search engine optimization and gave him some other ideas – especially when writing the content for his new website. We set him up with a new domain name for his previous site that we created. His original domain name was exceptionally long and therefore it was shortened considerably. Trey provided us the content for the new website and we had the majority of the site done within a few days of receiving the info. After a few more modifications and changes, he was ready to go live with the site! 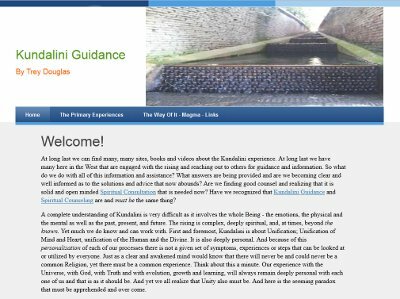 Trey’s new website is at kundaliniguidance.com. We appreciate Trey’s continued business – and he hopes to have us create another website for him in the near future as well!